Lately life has been crazy. It seems like everything is going a bazillion miles an hour, but it's always good to take some time to look around and appreciate the happy moments. Happy moments like . . .
. . . finally convincing Josh to hit the trails with me again. I'm kinda in love with mountain biking. Even though Dallas is definitely lacking some mountains, we've still got some fantastic trails with steep drops and sharp turns and creeks and trees and rocks galore.
. . . finding $12 shoes at Madewell and the only two pairs left were my size. They were originally $60. I put bargain shoppers to shame.
. . . finishing a bag of candy corn m&ms on a lazy Saturday morning breakfast in bed.
. . . having fancy non-alcoholic drinks to consume on call days.
. . . being crowned the all-time laziest pumpkin carvers ever. At least Charlie still loves us.
. . . praying these bad boys can make a comeback. 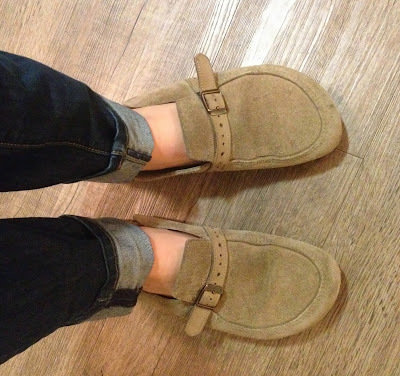 These Birkenstocks were my high school staples, I'm shocked I held on to them this long but they are the most comfortable shoes I own. In other happy news, I'm heading off to Kentucky today for a girls weekend smacked full of mint juleps, horsey races, and quality time with two of my favorite girls. This time last year . . .